Basseterre, St. Kitts-The Leeward Islands Hurricanes fell to their second straight defeat when they lost an innings defeat inside three days to the Jamaican Scorpions in a day/night four-day fixture at Warner Park Dec. 15 to 18. After winning the toss, the Leeward Islands elected to bat first on what seemed to be a batsman friendly surface. Captian Keiran Powell opening the innings looked fluent as he eased his way to 18 before he was trapped LBW by Damion Jacob’s. The Leewards then lost two more quick wickets after Powell’s departure to be 25-3 in the first hour of the encounter with Monticin Hodge and Kacey Carty both failing to trouble the scorers. 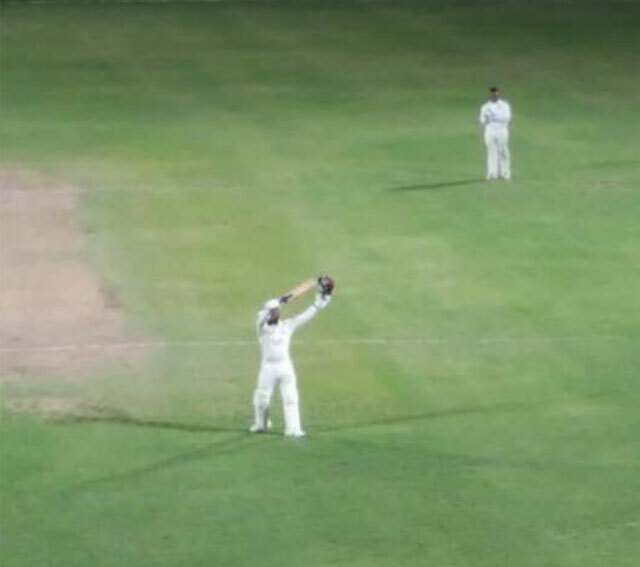 A 68 run partnership between Chesney Hughes and Jahmar Hamilton helped to rebuild the innings until Hughes was magnificently bowled by Jacobs for 30. Two overs later Tonito Willet a suffered the same fate from Jacobs leaving the Leewards at 96-5. However Mr. Hamilton and Rakeem Cornwall steadied the innings with a 102 before the latter became Jacobs third victim as he departed for 66. Hamilton howeve continued his brilliant innings as wickets continue to fall around him to record his second straight first class century. But Mr. Jacobs and Captain Nikita Miller ran thru the Leeward Islands tail to dismiss them for 243 on the first evening. Jacobs was the top Jamaican bowler with five wickets for 103 runs while Miller contributed two wickets for 49 runs. The Scorpions openers John Campbell and Shacaya Thomas had a difficult 10 over period to face late on evening one and both were dropped before they got off the mark. On the second day the Jamaican openers aimed to build upon their opportunity and Mr. Thomas tore apart the Leeward Islands bowling attack, stroking 54 runs from 65 balls hitting that included nine fours and a six until he was undone by an unplayable delivery from Alzarri Joseph. His departure led to the arrival of Jermaine Blackwood who kept up the scoring tempo Thomas had set as he and Mr. Campbell put on a partnership of 112 in just 19 overs that brought up the Scorpions 200 in just 37 overs. When Blackwood was magnificently caught at cover for 55 off 58 balls and soon after lost Campbell for 88 and Andre Mccarthy for a duck, the Leeward Islands saw a route back into the encounter. Brandon King and Devon Thomas had other ideas as they both weathered difficult starts before they looked at their fluent best with Mr. King regularly clearing the boundary and Thomas playing a supporting role. The Leewards however suffered a blow with their top bowler Mr. Cornwall leaving the field due to injury. Jamaica finished the second evening on 461-4 with King not out on 155 from 175 balls and Devon Thomas unbeaten on 75. On day three King continued his aggressiveness as he closed in on a double century but tried to clear the boundary one time to many and held out at long on for 194 that included 17 fours and 13 sixes. Thomas however continued to inch towards his century which he successfully completed. However as soon as the team achieved 550 runs the innings was declared with seven wickets down and a lead of 307. With an overwhelming to chip away the Leeward Island Captain Powell came to the crease and immediately opened the scoring with a boundary which was followed by three more boundaries in the first over. He then continued in the same vein in the second over as he hoist the Jamaican bowlers all over the park as he seemingly was aiming to replicate the Jamaican scoring rate. He met his demise after he was brilliantly caught at cover by Campbell for 40 off 14 balls. Monticin Hodge however departed shortly after Mr. Carty and Mr. Hughes put together a patient partnership before Jacobs removed Carty in his very first over for 24. Hughes and Hamilton combined for another 60 run partnership until a bad shot led to the demise of Hughes to Miller for 54, that sparked a collapsed of Leeward Island batsmen with Jacobs again at the forefront of the Jamaican bowling attack the a second five wicket haul. The Leewards were eventually bowled out for 234 to record a loss by an innings and 73 runs. Man of the Match was Brandon King.